The slaying of 17-year-old Trayvon Martin, a Florida high school student who was shot and killed by George Zimmerman, a self-appointed neighborhood watch captain, has captured national attention. Petitions calling for justice for Martin have exploded, amid allegations of racism and calls for more scrutiny into how local police handled the investigation. George Zimmerman has yet to be charged in the case. Feb. 26: Trayvon Martin, a 17-year-old Florida high school student, is found shot and killed, in Sanford, Fla., a community north of Orlando. Trayvon Martin: a typical teen who loved video games, looked forward to prom, Trayvon Martin’s death gripped the nation, but in life he was a typical Miami teen who texted his friends, loved video games and saw his future in aviation. Trayvon Martin spent his 17th birthday, which would be his last, with his family. He ate a home-cooked meal followed by cake, opened presents that included Levis jeans, Adidas sneakers and a bottle of Issey Miyake cologne. He would be 17 for 21 days. He had transferred from Miami Carol City High School during his sophomore year to Michael Krop Senior High, where he was a junior. His English teacher, Michelle Kypriss, reported him as being "an A and B student who majored in cheerfulness." He hoped to become an aviation mechanic. He was visiting his father and his father's fiance, Brandi Green, at her rented townhome in Sanford, Florida, on the day he was killed, after being suspended from school for 10 days. Kypriss stated that he "was not a violent or dangerous child", "not known for misbehaving", and "was suspended because he was late too many times." According to his father Tracy Martin, he was suspended because he was in an unauthorized area on school property, but he declined to offer more details. Trayvon Martin had no criminal record. This was just so wrong. 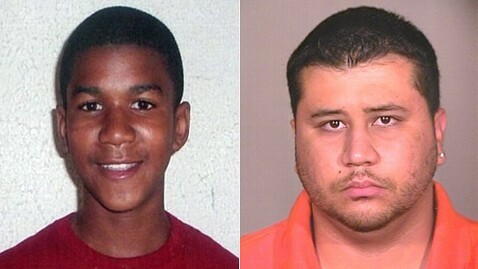 Why do we give people like Zimmerman a license to kill? Zimmerman was told to "stand down". ARLINGTON — Former Florida Gov. Jeb Bush said Friday that the “stand your ground” self-defense law he signed while in office should not apply to the case of a teenager who was killed by a neighborhood watch volunteer in his home state. "He was an A and B Student who majored in Cheerfulness"
Martin's parents also met Friday with the newly-appointed special prosecutor in the case, and the family's legal team plans to pursue a civil case against the Twin Lakes homeowner's association, Parks said. ME: You cannot just throw-a-way a life. Can you imagine, TM, was on a slab, in the Morgue for three days? No one gave a hoot. I wish them well on the civil case. “That the effort for Trayron was not a black and white thing, but a right and wrong thing"
George Zimmerman, the man hated Peruvian roots in the U.S. The debate is on over the eye of George Zimmerman Peruvian roots. The object of repudiation of an entire country after having shot and killed an African American youth hooded walked the streets of Florida. The reason Martin Trayvon killed in Sanford on February 26 he claimed, was for defense. While they say racist throughout the United States, the story of his life attenuates the serious charge that falls on their shoulders. So say his parents desperately trying to clean it. But who is George Zimmerman? Catholic faith, the son of an American father and mother white skin of Peruvian origin, his family has said that Zimmerman has color family. "It's Spanish and grew up in a multiracial family," said his father Robert Zimmerman in a letter to the media. This citizen of 28 years lived at The Retreat, a gated community where, despite dozens of houses are stuck together harmoniously alongside each other, no one knows any detail of the life of the neighbor, according to AFP. A source identified the mother Gladys George Zimmerman, as a Peruvian. According to this person, Gladys worked as an interpreter at the court of Virginia in this country, said yesterday the "Washington Post". Another contradiction is his name, which would suggest that you have some link with the Jewish religion, but who lived around the Zimmerman remember them as "very Catholic." "The media presentation about George as a racist can not be further from the truth," he wrote in a letter to the "Orlando Sentinel" his father without revealing the whereabouts of the defendant. This is a subject with a history of violence. He has received numerous complaints of domestic abuse between 2002 and 2006, and in all cases are defended by asserting that he had been attacked by their girlfriends. At the moment, following a dialogue 911 in which a man from Peru called 'rogue' to Martin, the deceased's family and the entire American society want to see behind bars. Several eyewitnesses report to police that they heard a scuffle, then a cry for help, and then a gunshot. "It is not a black and white thing, it is a right and wrong thing"
I guess LE must have trusted GZ ,so much, where reportly a background check was not run on him, going by this transcript. UNIDENTIFIED MALE: The Sanford Police Department's initial investigation was ridiculous. Here's a man standing with a weapon in his hand, and they take his word that he's never been arrested. Then they do not do a background check on Mr. Zimmerman. How is that possible, when they stop me at a traffic light and do a background investigation on me? If Sanford police had done what they were supposed to do initially, we would not be here tonight because Mr. Zimmerman would have been arrested. The parents of the unarmed black Florida teenager slain three weeks ago by an overzealous neighborhood watchman joined a “million hoodie” march in Union Square Wednesday demanding the shooter’s arrest. “Our son is your son,” Trayvon Martin’s mom Sybrina Fulton told a big crowd. Tens of thousands of people are expected to rally in Sanford on Monday at Fort Mellon Park to demand justice in Trayvon Martin's shooting death. (CBS News) A friend of George Zimmerman, the Sanford, Fla., neighborhood watch volunteer who fatally shot Trayvon Martin last month, said that the incident was not racially motivated, although he said the shooting has inspired a needed conversation about race relations in this country. Appearing on "CBS This Morning," Joe Oliver said, "This incident on its own is not a racial incident; this story is a racial story ... It has sparked a dialogue that needs to be made, because I live with what they're talking about every day. But in this particular instance when it involves this happening, it was not racially motivated." Oliver also told Erica Hill that Zimmerman, who he spoke to over the weekend, is frustrated that he cannot tell his story because of impending grand jury proceedings. He said that understanding exactly what happened between the time Zimmerman got out of his vehicle and the time the gun went off cannot be known until all the evidence is presented to the grand jury. "The hard part about this," Oliver said, is that Zimmerman "wants to tell what happened but he's been instructed not to. Trayvon Martin took down George Zimmerman with one punch then climbed on top of him and slammed his head into the sidewalk several times before the 17-year-old was shot to death by the community watch volunteer, authorities revealed Monday. The latest report of the altercation between the Miami high school student and the 28-year-old man at a Sanford gated community on Feb. 26 has been corroborated by witnesses, authorities told the Orlando Sentinel. Calls to the FBI, U.S. Justice Department and Sanford Police weren't immediately returned Monday. Zimmerman told police he had turned around and was walking back to his SUV when Martin approached him from behind and the two got into a verbal altercation, the report said. Martin punched Zimmerman in the nose and began beating him on the ground, leaving him bloodied and battered, authorities said, according to the report. Zimmerman told police he shot the unarmed Martin in self-defense. By Patrik Jonsson, Christian Science Monitor | 08:48 am. George Zimmerman, the 28-year-old former altar boy whose shooting of Trayvon Martin, an unarmed black teenager, has caused a national uproar, has withdrawn into seclusion. His lawyer says he’s afraid for his life amid numerous death threats. As Florida and federal investigators dig into the Feb. 26 shooting and the Sanford Police Department's decision to not charge Zimmerman with a crime, attempts to understand the shooting have focused on the extent to which Zimmerman's past experiences colored his decisions in the moments before Trayvon died. Zimmerman's attorney, Craig Sonner, has indicated they will invoke Florida's "stand-your-ground" law, which provides significant leeway for someone to use deadly force if they feel their life is in danger. He says Zimmerman suffered a broken nose and a gash to the back of his head as a result of his encounter with Martin. "The stand-your-ground law is one portion of justifiable use of deadly force," prosecutor Angela Corey told ABC News. "And what that means is that the state must go forward and be able to prove it's case beyond a reasonable doubt ... So it makes the case in general more difficult than a normal criminal case." Page created in 2.13 seconds with 20 queries.